Even for the most affluent of the individuals, who might have experienced top of the line luxury and extravagance, the allure of a luxury cruise is undeniable. The amazing services, combined with the close emphasis on detail and priority for the satisfaction and enjoyment for the guests is something which cannot be ignored in case of these cruise ships when they are compared to the ordinary liners. There was a time when luxury cruises was some kind of a dream for an ordinary individual and only few could afford this extravaganza. However, with the introduction of Luxury Cruises within the exotic locales of India, this dream became much more accessible. Some of these liners, such as The Oberoi MV Vrinda, River Ganges Heritage Cruise, and The Sunderbans Luxury Cruise etc. have over the time gained much popularity within the tourist community for their excellent services, amazing comfort and abundant leisure to provide the visitors an incredible time that will remain indelible from their mind for a long time. So, in addition to the luxury cruises mentioned above, which are the other ships in the line for such an incomparable indulgent experience on the waters of India and in the wonderfully exquisite locations? Let’s find out the Top 5 Luxury Cruises in India in the following article. The Sunderbans is one of the largest reserve of mangrove ecosystem and a declared 1985 UNESCO World heritage site. Being one of the most beautiful places on Earth, the location is a heaven of tremendous natural beauty, astonishing sites, exotic wildlife with a varied diversity of birds, reptiles, invertebrate species and of course the Royal Bengal Tiger and numerous water channels, creeks and streams flowing through its extensive area. A sojourn through this incredible wealth of nature combined with memorable creek rides, thrilling forest walks, exploratory visits to fishermen’s coves and adventurous stopovers at the watch towers is one of the most cherished wishes for many. 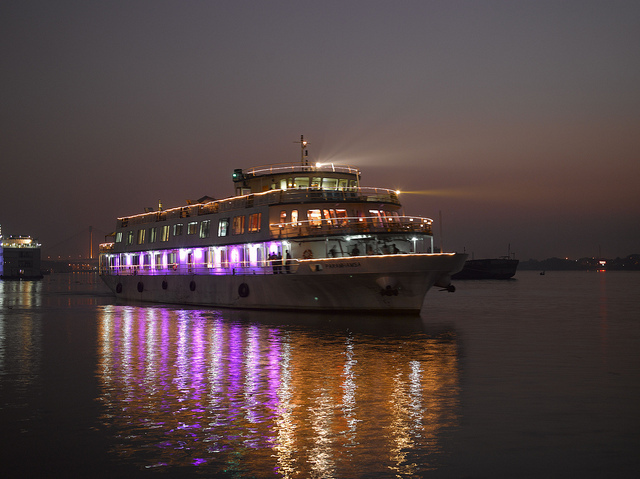 Bringing you this magical and exciting trip subdued in amazing luxury and amenities is Sunderbans Luxury Cruise. The fabulous excursion takes you through rambling water channels and creeks, into the serenity of the forests and letting you soak in the incredible ambience. This memorable journey is attended by an excellent hospitality ministered by expert chefs who take care of your appetite and are there to serve your taste buds by bringing you dishes of the recipes from all over the world. Moreover, there is a facility of a gym, while soothing your nerves and muscles is the exclusive Ayurveda treatment and massage parlor. Moreover, there is also a library and a bar, a conference room with internet facilities and fax to enable travelers, both leisure and corporate, to have a useful and relaxing time. M.V. 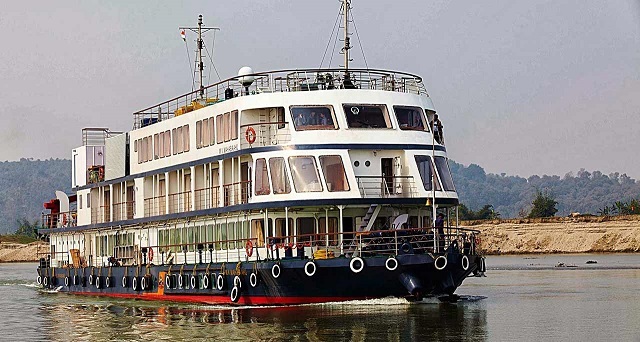 Paramhansa, the cruise letting you enjoy the beauty of Sunderbans is a spacious vessel, approximately 53 m in length with a total number of 32 cabins. All the rooms come with air condition and has the facility of attached bathrooms for the convenience of the guests. With 12 luxury rooms on the first deck and 20 deluxe rooms on the main deck, other attached amenities include a telephone, tea and coffee maker, ample reading stuff and also an emergency kit. With such a marvelous reception, comfort and luxury in such a wonderful setting is definitely an experience of a lifetime. The Oberoi M.V Vrinda is one of the most luxurious, private accommodations available on the backwaters of Kerala. Decked with fully furnished deluxe cabins with king-sized beds, paneled with shining teak flooring and filled with natural light, these cabins have been designed keeping the comfort and convenience of the guests in mind and are fixed with all the latest equipment and provided with top of the level services. These include a 42” LCD television, a DVD player, an electronic safe and internationally compatible plug points as well as other complimentary service include a 24-hour personal butler, hi-speed Wi-Fi and an in house entertainment system. The in-house restaurant is a wonderful, all day long eating space, filled with natural light and refreshing air. For the entertainment of the guests, an exquisite seating arrangement is done and they are treated to traditional dance and musical performances. Guests can book the whole boat or a small conference or seminar room for the business and corporate meetings. 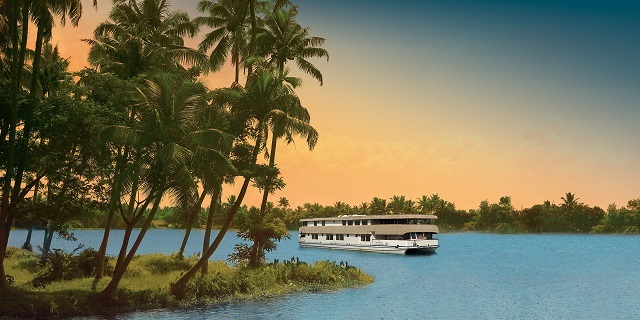 The Oberoi M V Vrinda Cruise takes you along through the largest backwater stretch, i.e. the Vembanad Lake, the vibrant waterways of Allepy. Within such a beautiful and wonderful settings and conducted with such luxuries and facilities, cruising with The Oberoi M V Vrinda is an experience worth being etched in your mind forever. One of the greatest heritage and luxury cruises, taking you along one of the greatest rivers in the world-The Ganges, M.V Paramhansa, the luxury cruise ship, is all about grandeur, comfort and style, letting you soak the amazing local ambience around the India’s most sacred river. The exquisite hospitality on board will strike a chord with the guests as the ship with its 32 spacious, fully furnished rooms with latest of facilities like a telephone connection, reading material, tea and coffee maker etc. will make the guests enjoy the best of their leisure time and will be able to sufficiently relax and unwind themselves. Almost all the needs of a luxury vessel has been taken care of in the ship as tourists are treated to the convenience of massage parlor, a gym and a modern library. 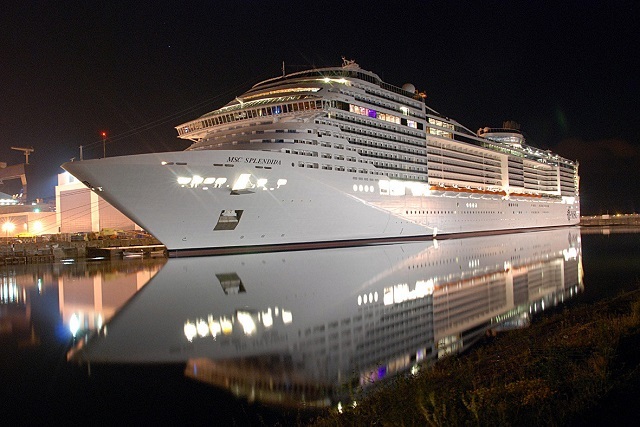 Travelling by the cruise, one will enjoy an easy pace of life on board with amenities of international standards. On the other hand, for the pleasure of the taste buds, the chefs on the ship will prepare for you some the most appetizing, delectable multi-cuisine dishes for the best of experiences. Itinerary of the cruise covers several sites of the eastern part of India which lies along the banks of the Ganges. Tourists will get to see the famous battlefield of Plassey, the sacred site of Navadvip, experience the elegant French ambience of Chandanagar, while they will also sail through the popular and historic cities and town of Kolkata, Dakshineshwar, Belur, Kalna, Mayapur and Murshidabad as well. The Ganges is considered holy for Hindus and has been a cradle for a major civilization of the world. Thus, taking a cruise over this amazing and timeless river is one of the most incredible adventures of a lifetime. 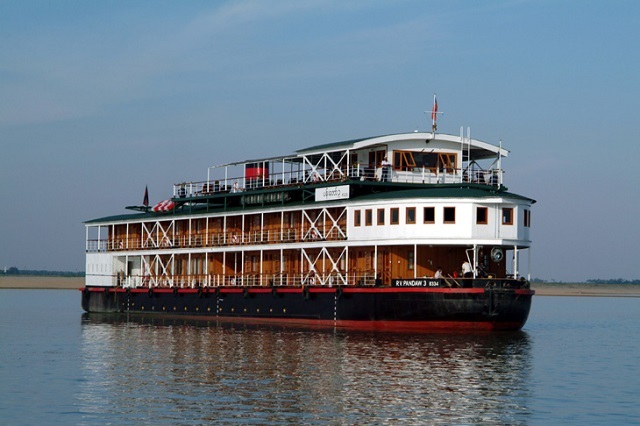 M.V Mahabaahu is a supremely luxury expedition on the mighty Bharamaputra river which flows through the state of Assam and drains into Bay of Bengal. The river spans from 3 to 40 kilometers through Assam and flows under the shadow of the mighty eastern Himalayas, some of which reach a height of imposing 7,400 meters. Visitors get to experience excellent luxury along with the natural beauty around the river within the comfort of two suites, nine superior cabins with attached balconies and 12 superior cabins without balconies. The cruise takes the guests across a range of attractions some of which are beautiful forests, exotic sights, rice paddies of Assam and exquisite Buddhist monasteries and Hindu gurukuls, carrying a tradition of indigenous method of teaching for over 5,000 years. The ship is 55m long and 10 m wide and has 5 decks including one inside the hull and a top deck which is open to sun. The MV Mahabahu was awarded the Tourism Award for 2012 by the CNBC News Channel. Whether a guest chooses three, five or seven nights down or upstream, they are treated with excellent hospitality and served with some of the most savory, multi-cuisine dishes. Moreover, under the guidance of experienced senior officials, guests can explore the region, browse the ship’s own well-stocked library, enjoy the relaxing board games or even ease off in the ship’s rejuvenating health spas, message facilities and a range of other indulging treatments. Lakshawadweep is one of the most exotic destinations in India rich with amazing diversity of marine life and astonishing sights with expansive sandy beaches, clear and azure sea water and incredible range of the flora and fauna. Making you experience these exquisite views and extraordinary beauty with incomparable comfort is M.V. Kavarati, the fabulous cruise ship designed especially for the Lakshadweep Islands to promote tourism. The 120 meter long ship with a total carrying capacity of 700 passengers and 200 tons of cargo is the largest passenger vessel ever created in India that is built with a total estimated cost of Rs. 173 crore INR. A modern liner fixed with latest comforts and amenities, the ship has a world-class 152-seater cafeteria, a 100-seater dining hall, a gymnasium, a recreation room and a large airspace for the best of the cruise experiences for the guests. The vessel has in total of 100 Deluxe Berths and 70 First Class Berths that accommodate enough guests according to their convenience and comfort. Built by Hindustan Shipyard, Vishakapatnam, the ship has a robust structure and a comfortable make up with elegant international standard services. It has independent galleys, halls, swimming pool and a helipad. The guests are treated to some really delectable and mouthwatering dishes to let them have a memorable journey. Besides, there is a facility of on-call entertainment, doctor on-call, and upper deck promenade as well. Lakshwadeep has in total of 36 islands and is located about 220 km from the Kerala’s Malabar Coast. It is one of the most popular tourist destination and an exotic traveler’s paradise. In addition to the this amazing cruise, travelers can enjoy numerous water sporting activities like boating, kayaking, jet skis, sea swimming, snorkeling and deep sea diving at Lakshwadeep. With such an incredible expedition along with stunningly beautiful views and in the lap of extraordinary luxury is an experience which is hard to miss.